This “vignetted” initial capital letter I was used as a drop cap at the start of a chapter. 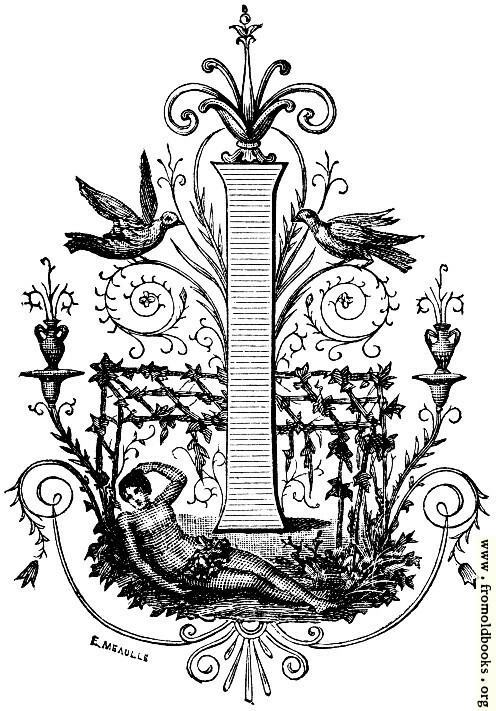 It includes two birds (songbirds I think, by their shapes) siting on swirly vines; two urns sprouting out of branches; a trellis with ivy; tulips; and, at the base, a woman wearing a very brief costume of leaves lying in a shady bower, or perhaps darkened by the warm summer sun, one arm reaching back to hold her hair, her outstretched legs crossed at the ankle. 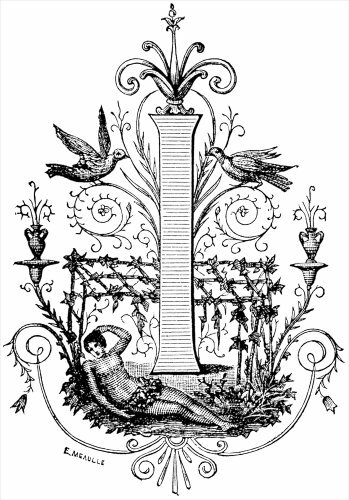 The initial is the work of the French engraver and artist Méaulle Fortuné-Louis, or at least bears his signature; Joseph Blanc may also have been involved in this, as he is credited with drawing the pictures in the book.